Mike Hawkins (Mike Norris, in what is perhaps a Tony Danza-like situation where he can only play guys named Mike to avoid being confused) is a young adult who loves nothing more than to hang out at “War In Peace Survival Camp” and stage mock battles, wars and “survival games”. Even the founder of WIPSC, a man inexplicably named Sugar Bear, who was in “Nam with Mike‘s dad (Bernard), keeps telling Mike to make more of himself and go to college. That’s also what his parents tell him. But Mike just wants to keep on Survival Gamin’. Meanwhile, Dave Forrest (Cassel) gets out of prison after 17 years. Forrest is a man after the fashion of Timothy Leary - a 60’s-era guru who invented an LSD-like drug called “Forrest Fire”. All he wants to do is talk to his poster of Jimi Hendrix and just chill with some good vibes, man. But his daughter C.J. (Goodrich) gets into a car accident with Mike, and the two of them end up going on the run because some evil gangsters are convinced the Forrest family has a multi-million dollar stash of drug money. So they kidnap Dave and C.J., and only one man with the proper survival skills can save them from the gangsters...MIKE HAWKINS! Survival Game is very dumb, and has frighteningly little action. What action there is happens to be pretty goofy indeed. It seems this whole venture was cooked up as a cash-in to the Norris name in the go-go 80’s. We actually like Mike Norris, this isn’t a slam on him, but this movie is pretty half-baked. It becomes an uninspiring hostage drama at a certain point and the pace slacks big time. What this movie needed was to ramp up the action, violence and intensity. It seems director Herb Freed was unfamiliar with the techniques of action cinema at the time. Though this movie was released in ‘87, his next movie after this one was Subterfuge (1996), the Matt McColm non-classic. Subterfuge is more entertaining than this, but that should still tell you something. Perhaps in keeping with the 60’s-era characters like Dave Forrest, there are plenty of songs on the soundtrack from that time. The Count Five’s “Psychotic Reaction” makes an appearance, but you truly haven’t heard “Louie Louie” until you’ve heard it as the background music while Mike Norris runs through a department store in true “Scooby Doo” style. The song plays in its entirety, no less. Getting every penny out of it, apparently. As for the original music, there’s a theme that sounds EXACTLY like “Axel F”. Harold Faltermeyer should sue. But hey, it was the 80’s. It was a different time. A time when carbon-copy action movies with carbon-copy music hit video store shelves and no one complained and life was good. If the theme of this movie is nostalgia, it truly has come full circle. Released by Media, it’s hard to truly throw our weight behind Survival Game, but its inoffensive, bland quasi-entertainment might appeal to someone. Yeah this definitely could've used more action, still found it prettty watchable overall though. 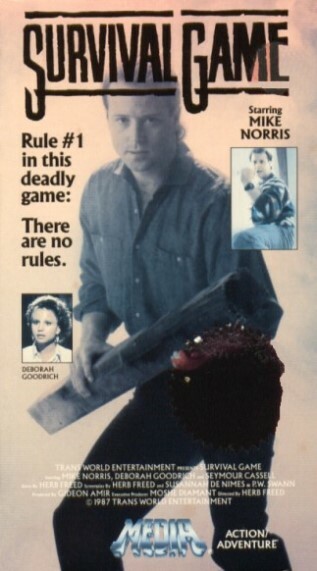 Totally agree about the action part...Mike Norris could've done some more martial arts. Ha! I remember this! lol. Well I remember the cover mostly. The experience of actually watching it has gone, so I guess it wasn't much of an experience after all. Great review! Thanks! Yep, that's pretty much the reaction anybody would have. The movie is forgettable, but the cover was often seen in video stores...because no one wanted to take a chance on it. This is exactly how I remember this movie from watching it on TV in the mid-90s. I was surprised at the lack of action. This was pretty weak...That's cool you remember watching it on TV though.